For me, there are only two ways to get to a ball park I care about. I can either hit the Rock Island and get dropped off at the 35th Street station. Or I can work my way to the Ryan and exit at the same place. Both put me in Sox Comiskey US Cellular Guaranteed Rate Park. And while I have been near that falling apart thing up north a few times, I have not stepped foot inside for a game since 1984. Yet, off the top of my head, I can think of three ways to get to Wrigley. You can take the Red line to get dropped off at the Park. You can take the Kennedy, get off at Addison and work your way east. Or you can take Lake Shore Drive, exit Addison and head west. And yes, I have heard all the baseball purists speak. I have lived here 50+ years. Blah blah cute ballpark blah blah manual scoreboard blah blah vines blah blah sunshine blah blah blah bleachers. Even in my north side dislike of....well...everything north side, I can say that Wrigley will provide a great backdrop for fine photography. Many ballparks have blue outfield walls, and being an unnatural color that close to the ground tends to give a photo an artificial feel. See how green pairs so well with the bright white of the Cubs home uniforms, and the just off white grays of the Astros? Sosa's helmet pops against the weeds vines of the outfield wall. Even with the large foil badging on this card from Upper Deck, they still fit the entire play on the card, barely chopping off Sosa's knees and Biggio's cap. One would claim so much unused space with the green. I say all that extra is window dressing when your eyes focus on the bright players. 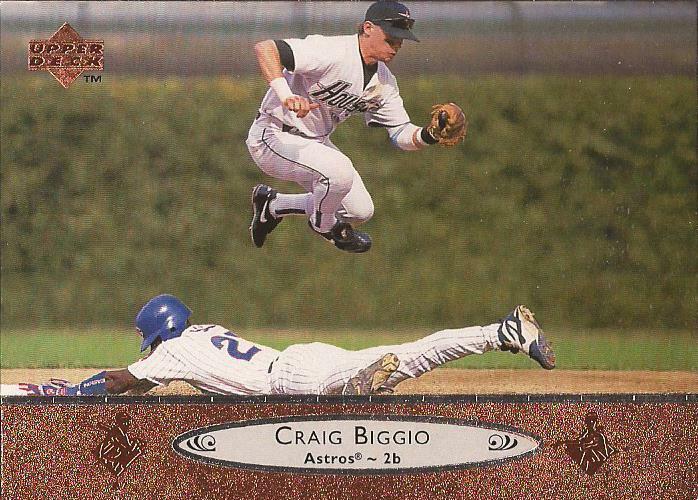 Even Biggio's two in one stirrups are forgiven. May 5th. That is the release date of the 2nd Guardians of the Galaxy movie. I hope to be there opening weekend, though the smart me says to wait a week. But a week ago they released the song list from Peter's Awesome Mix Volume #2, and one of the songs is a local hit by Aliotta Haynes and Jeremiah called Lake Shore Drive. I'm sure many of you may be hearing this song for the first time (maybe 2nd, as I have used this at the end of a post once before). And in hearing, the first thought will be "this is a hit"? I can only respond with the rote, nonsensical response "it's a Chicago thing". Because this song grows into your heart, from when I first heard it on WLS, WCFL or the Mighty MET, or hearing it now on XRT, The River or the Drive. You love the song or you hate it. And if you hate it, then get out of town. Or go live in Wrigley. I'll never visit you there. Love this tune - it happened to come in one summer evening while I was making my way down Lake Shore Drive and the experience was almost transcendental. I had goosebumps. That said, I'm thoroughly surprised that it appears in a blockbuster such as Guardians... someone on the production team must be a Chicagoan. I enjoyed my visit to Wrigley but I am here to tell you that last summers game at Comiskey was a whole lot of fun. From pulling up in the parking lot with Texas plates and getting surrounded by friendly, curious Sox fans to getting out of the lot in two minutes it was very memorable. Good concessions (other than having to hunt for 'crafty' beer) and the Billy Pierce statue were toppers. And Lake Shore Drive is awesome. If I wasn't planning a hockey trip to NYC for the fall I'd be back in Chicago this summer. I probably missed the boat on my chance to see the Pirates at Wrigley for a while since the Cubs are extremely good. I'll probably have to wait for a series agains the White Sox. I'm headed to Chicago next summer... and absolutely need to visit Wrigley. I'll be scheduling my trip around theirs. It'll be even cooler if the White Sox are home too. Living in the Bay Area, I have two teams in close proximity as well. Unfortunately most of my friends are Giants fans, so I end up going to AT&T more than O.co.